The Jewel is is located on vibrant Main Street in downtown Sarasota, Florida. It's a tower that's designated for numerous purposes. The 18-floor building, because of that, has a nice combination of residences and businesses. The Jewel is situated in a great spot right where Palm Avenue and Main Street come together. Read More About The Jewel. Included below are properties for sale in The Jewel, a development in Downtown Sarasota FL. These The Jewel real estate listings are updated daily from the MFRMLS. 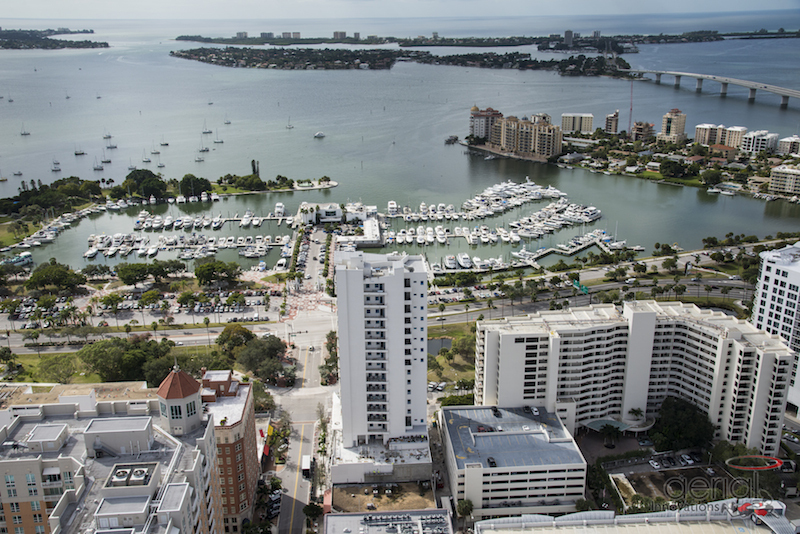 The Jewel's condo units are optimal for people who are fond of scenic bay views. The condominiums are optimal for people who are fond of excellent amenities in general. Residents of The Jewel are invited to stop by a level that includes a swimming pool (with LED lighting), exercise center, putting green, Jacuzzi, steam bath (open to people of both genders), rain shower, platform tennis court, yoga room, outdoor section and lounge. People who want to soak up the sun can enjoy leisurely afternoons in the outdoor section. People who want to work out and work up a sweat can head to the exercise center. People who want to cool off can go for a few laps in the swimming pool, too. The choices in activities available at The Jewel are plentiful. The Jewel is 132,838 square feet of beautiful and luxurious living. This downtown structure offers mesmerizing views of both the Golf of Mexico and the Sarasota Bay. People who like to feast their eyes on 360 degree vistas can have a ball at The Jewel. Parking is abundant at The Jewel. People who live in these condominiums never have to worry about circling endlessly for parking spots at the end of the day. That's because the tower has three whole levels that are designated exclusively for parking purposes. The Jewel has a lovely and unforgettable appearance. Its exterior is made of glass, stucco and porcelain. That's why the tower has a beautiful style that's a pleasant blend of the past, present and future. If you love the grace of decades past but also appreciate the conveniences of the current day, you won't be able to take your eyes off The Jewel. This residential tower is without a doubt in a great area for people who are bona fide dining enthusiasts. That's because the choices in restaurants on Main Street are absolutely fantastic. People who enjoy seafood, Mediterranean, Peruvian, Mexican and Italian dishes have many options in reputable dining establishments on Main Street. Main Street also makes a fabulous location for people who appreciate All-American comfort foods.